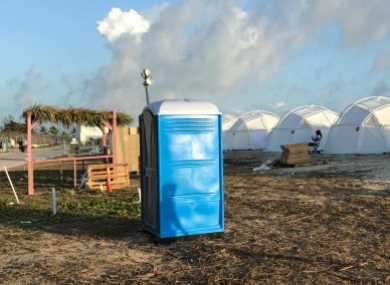 Tents and a portable toilet at the Fyre Festival. FOUNDERS OF THE infamously failed Fyre music festival in the Bahamas last year have settled charges they defrauded investors out of nearly $30 million (€25 million), US market regulators announced today. Billy McFarland, a New York entrepreneur, admitted to charges he used pilfered funds to bankroll a lavish lifestyle, including a Manhattan penthouse, parties with celebrities, a private plane and chauffeured luxury cars, the Securities and Exchange Commission said. He spear-headed last year’s disastrous Fyre Festival, which had billed itself as the ultimate upscale getaway amid a fast-growing market for music events. Hundreds of partygoers headed to the Bahamas, some paying more than $100,000 each, but instead found tent encampments and cuisine that was just rudimentary sandwiches. “McFarland gained the trust of investors by falsely portraying himself as a skilled entrepreneur running a series of successful media companies,” Melissa Hodgman, associate director of the SEC’s enforcement division, said in a statement. According to the SEC, in one case, McFarland gave investors a doctored brokerage account statement, claiming it held $2.5 million (€2 million) when in fact it held shares worth only $1,500 (€1,100). McFarland was arrested in June on charges of selling fraudulent tickets to major events such as the Coachella festival and was awaiting sentencing. In settling with the SEC this week, McFarland admitted to the charges, agreed to return $27.4 million (€23.4 million) in ill-gotten gains from 100 investors, and agreed to be barred for life from being a corporate officer or director. Chief Marketing Officer Grant Margolin and Daniel Simon, an independent contractor, and two companies also settled with the SEC but did not admit or deny the charges. Margolin and Simon will pay fines of $35,000 (€29,900) and $15,000 (€12,830), respectively. The settlements are subject to court approval. Earlier this month, a North Carolina judge awarded $5 million (€4.2 million) in compensation and punitive damages to two fans who had each paid $13,000 (€11,000) to attend the festival but ended up in tents where they said they felt unsafe. Numerous festival-goers posted pictures of shambolic scenes as they arrived and quickly turned around — setting off mockery in corners of the internet over the high prices many had handed over. Email “Organisers of disastrous Fyre Festival settle €24 million fraud case”. Feedback on “Organisers of disastrous Fyre Festival settle €24 million fraud case”.